Last week, Harper Lee died. She was 89. I have been pondering her much this last week. (Maybe more so even than the passing of David Bowie and Glenn Frey though equal to my musings on my friend, Natalie Cole.) Until 2015, Lee had published only one book. One. One of the very few Great American Novels. After my stint studying to be an actor at the American Academy of Dramatic Arts, I was hungry, no, starving, to continue gobbling up every bit of great acting wherever I could find it. I sought out every important movie I could find (VHS days), every play I could afford (waiter's salary), and listened to the spoken word recordings of the likes of Richard Burton and John Gielgud (perfect for LA traffic). Many of my contemporaries were dressing like Dustin Hoffman and combing their hair like Al Pacino. They were delving deep into the psycho babble of Strasberg. Making meals of cigarettes, cheap bourbon, and Cup Noodle. I was being drawn to a different kind of actor and, ultimately for me, a different kind of career. I found myself gravitating to the class and style of William Powell and William Warren. I still love the Pre-Code films of the early '30s and the deftly acted and directed screwball comedies of the 30s and 40s. I will stop whatever I am doing to dance with Fred & Ginger, light up a smoke with Bogart & Bacall, or muscle my way through a Gene Kelly number. (So, yes, I'm a fan of TCM.) I didn't want the mumbling anti-hero of James Dean. I didn't care all that much about the frantic intensity of the constantly-New-York-accented Pacino. I was looking for quiet power. Controlled technique. Acting choices based on writer's words not just personal reactions to internal, lizard brain desires. Then I saw Gregory Peck in "To Kill A Mockingbird." Everything changed. My search was over. The story itself is a roller coaster of humor and drama, innocence and racism. Peck's portrayal of Atticus Finch won him an Oscar - as it certainly should have done. He is, simply put, perfect in the role. To this day, this is mandatory viewing for my acting students. The character of Atticus is a towering figure. From height to humility, he is the very definition of a hero. But he is also a father of deep compassion and strength. A lawyer of thoughtful consideration and weighted intelligence. In 2003, AFI named Atticus Finch the greatest movie hero of the 20th century. Not Rocky Balboa or Iron Man. Not Indiana Jones or James Bond. Atticus Finch. A small town lawyer in Alabama. A widower with two kids. I left the theatre that day wanting to live my life like Atticus Finch, the character. Of course, that didn't last long. Youth and Hollywood soon dashed all hopes of me ever having that kind of courage or conviction -- or morality. But what did last, was my great desire to try to be as accomplished an actor as Gregory Peck. And if not as talented or skillful as he, then certainly as utterly believable as he was in that one role at least once in my fledgling career. 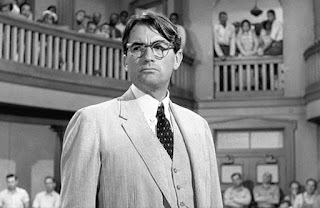 Gregory Peck in "To Kill A Mockingbird" was my benchmark for acting perfection. For some reason, my teachers always picked other things to make us write term papers on, so I didn't read Harper Lee's book in school. In watching this film for the first time, I had no frame of reference. Just the movie. 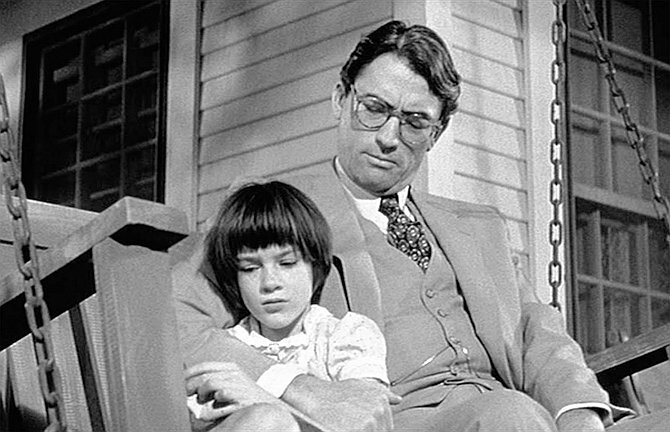 It wasn't until years later when I finally got around to reading the novel, that I realized how gracefully Horton Foote's screenplay captured the book and, indeed, the character of Atticus Finch. But even Foote's tremendously gentle screenplay would have been empty without Peck's Atticus. Maybe not empty, but certainly, less perfect. As I have gotten older I have gotten noticeably more liberal about my intake of art. (I'll even enjoy me some Pacino and Brando now! (Except "Scarface." Still, no. It's the accent.) I am much more accepting of imperfection in films and plays. A musician blows a sour note - what of it? A painting may not speak to me, but I'm sure there will be someone who appreciates it. Don't get me wrong, I still point out errors and poor execution. I still cringe at poor diction during a Shakespearean monologue and I have little patience for over-gesticulation buy a fresh-faced leading man. My wife and I still make good sport about how we could have fixed a certain line reading. But "To Kill a Mocking Bird" may just be the perfect film. I honestly cannot find a single thing that I would change. Boo Radley, Dill Harris, Bob Ewell. Wouldn't alter a line or gesture. Tom Robinson, Calpurnia, Judge Taylor. Wouldn't vary an expression or camera angle. Similarly, I can say the same thing about the book. Scout, Jem, Atticus. Wouldn't replace a single verb or tweek one little noun. Harper Lee's long life yet all-too-short career left us with so much heart and wisdom, it's no wonder that we feel that we actually knew her. We certainly knew and loved her characters. Certainly, the impact that one book and that one movie had on one young actor, changed him for the better -- and forever. Thank you, Harper Lee. Thank you, Gregory Peck. Thanks, Atticus.